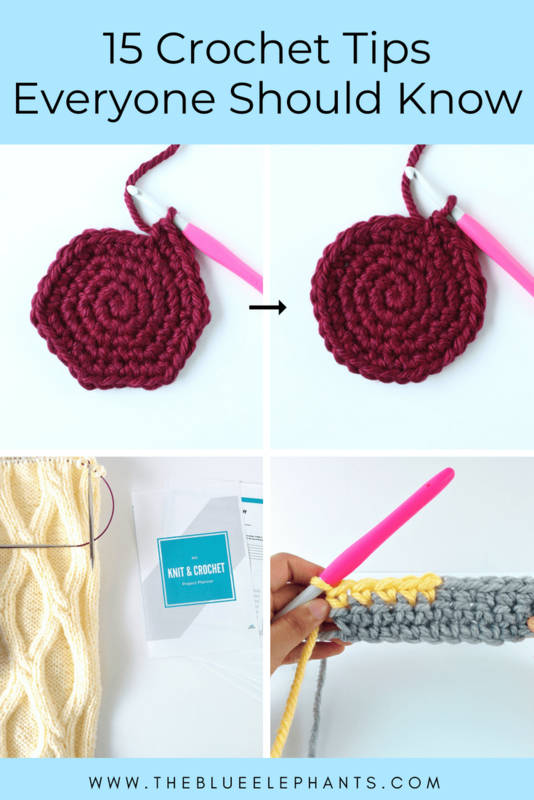 Crochet for Beginners: 15+ Crochet Tips Everyone Should Know! I’ve been crocheting for over 10 years now, and I’ve learned a lot of crochet tips and trick in that time. When I started, I just wanted to create fun pieces and see what I could do. I still want to have fun making things, but now I’m more focused on taking my crochet business to the next level. I’m a big believer in the idea that if you’re going to do something, do it well. So whether that’s teaching crochet for beginners, making money from crochet, and or just enjoying the process of creating something handmade, here are some of my top tips for better crochet! Many beginners have trouble getting an even tension on the foundation chain. With practice, you can get an even chain, but you can correct it by using a different hook for the chain. If you see that your starting chain is much tighter than the rest of your piece and pulls inward, move up a hook size. If the foundation chain is too loose and sitting wider than your piece, move down a hook size. If your piece ever looked like it got narrower or wider as you worked, it’s probably because you have the wrong stitch count. You might be unknowingly adding stitches to the end or skipping spaces as you move on to the next row. There are a few ways to fix this. You can pinch the fabric between your fingers and place your thumb at each stitch, then slide your fingers down the row as you go so you don’t miss any spaces. Or, you can place a stitch marker on the first and last stitch of each row. As soon as you work that space, place the marker and you won’t forget to work that space. Or you can just count. If you started with 10 SC and at the end of the row you only get to 9, you’ll know that you missed one and can go back to fix it. Speaking of counting stitches, an easy way to to do so is to look at the Vs. The tops of the stitches make a V shape just like the starting chain. 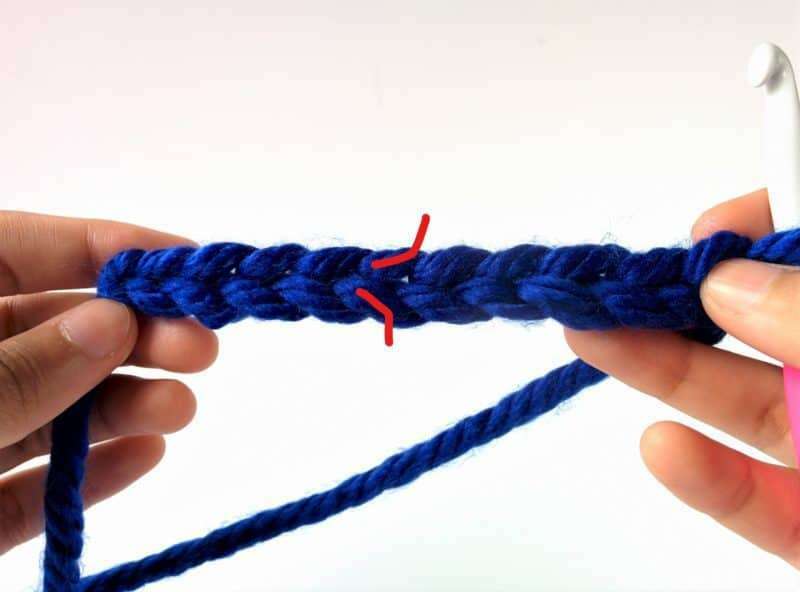 When you work into a stitch, you place your hook under both loops of the V (unless otherwise stated). So instead of counting the actual stitches, count the Vs on top to see how many stitches you have. 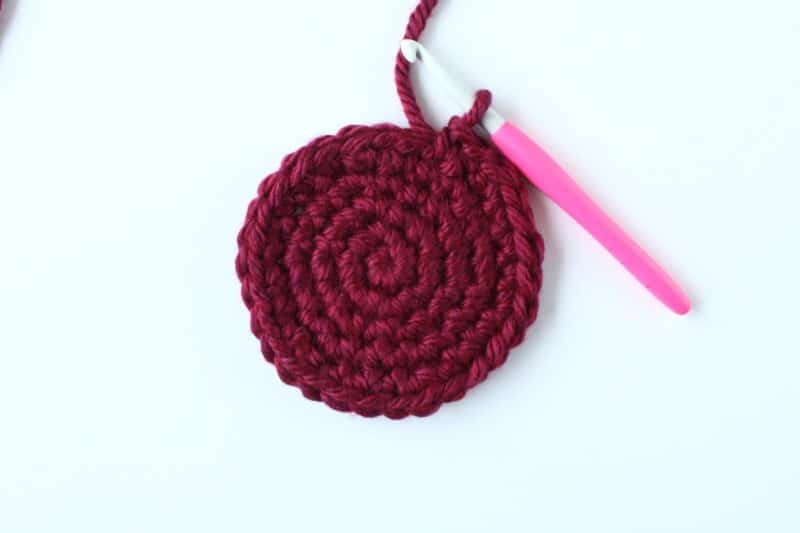 This is something most crochet for beginners courses tell you about briefly, but it’s so helpful and something that makes crocheting a lot easier. Invisible decreases are the BEST way to decrease in SC! 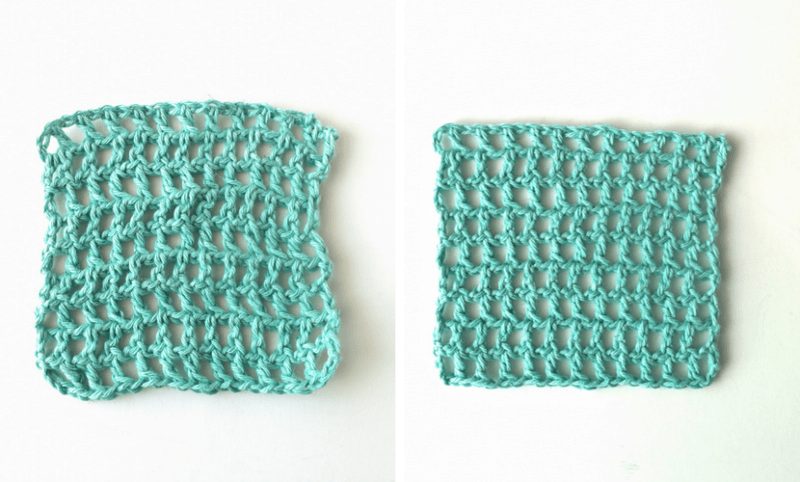 I learned crochet tip recently, and although I still love using my regular decrease, this one is even more discreet. 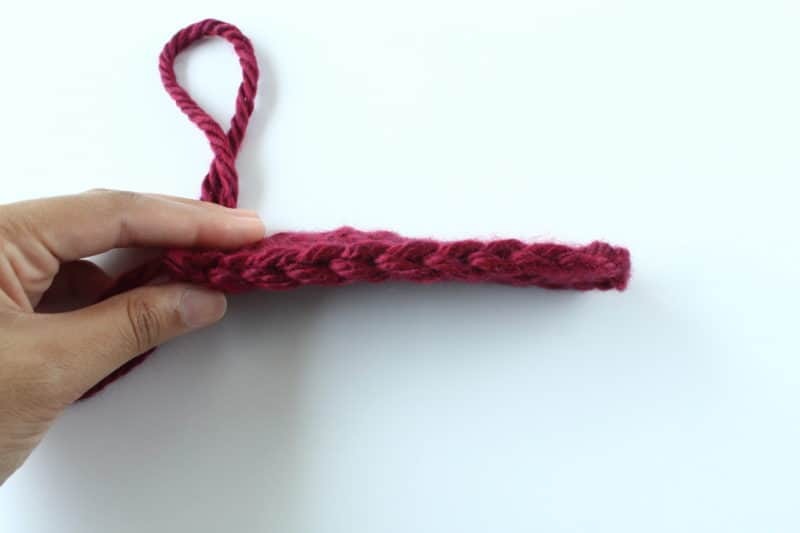 To work an invisible decrease, insert your hook under the front loop of the next two spaces, yarn over and pull through BOTH loops, then yarn over and finish the SC. Use a magic loop instead of a joined chain! When you’re working from the center, use a magic loop instead of a creating a chain and slip stitching to form a ring. With a magic loop, you can start a circle of any size and it’s easier to work into than a little ch-3 loop. You can also pull the loop closed tight so there’s no tiny hole left open. They create a better finish and are just so much more versatile than a joined chain. I haven’t used a joined chain in YEARS, so even when the pattern calls for it, I just use my magic loop. 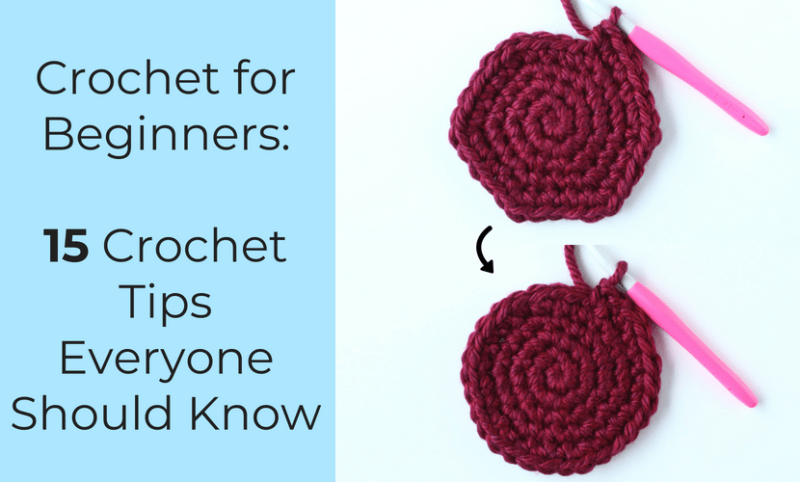 Everything that teaches crochet for beginners talks about using stitch markers, so some of you more advanced crocheters might think you can skip this one. NOPE! Stitch markers are so handy and they make your life easier. You can use them to mark the first space in the round, so you don’t have to count every single stitch to know when the round is done. Use them to mark rows so you can count back to find out how many rows you’ve done. You can use them to separate pattern repeats and then if you make a mistake, you’ll know RIGHT THEN if your numbers are wrong instead of 5 rows later. I even use my stitch markers to hold together my amigurumi pieces before I join them so I can see how it’s coming along. It is so much easier to prevent mistakes using stitch markers rather than going back, recounting, taking your work apart and doing it again. These are my favorite. Do your circles tend to look more like hexagons? This is because a stand increase pattern usually stacks the increases at the same distance so they end up creating points. As you widen the space between increases, your actual increases just line up on top of each other. This creates more of a hexagon shape. Round 6: SC 4, increase, repeat to end. Round 7: SC 5, increase, repeat to end. To fix this, stagger your increases. It’s sort of like you just rotated the outer round. For the next round, work only some of the SC before your first increase, then continue around in the pattern and end with the remaining SC. This way, you’re just shifting the increases over a few spaces. Round 8: SC 3, increase. *SC 6, increase* repeat until the last 3, then SC 3. You don’t need to do this for every round, just whenever it looks too hexagonal. 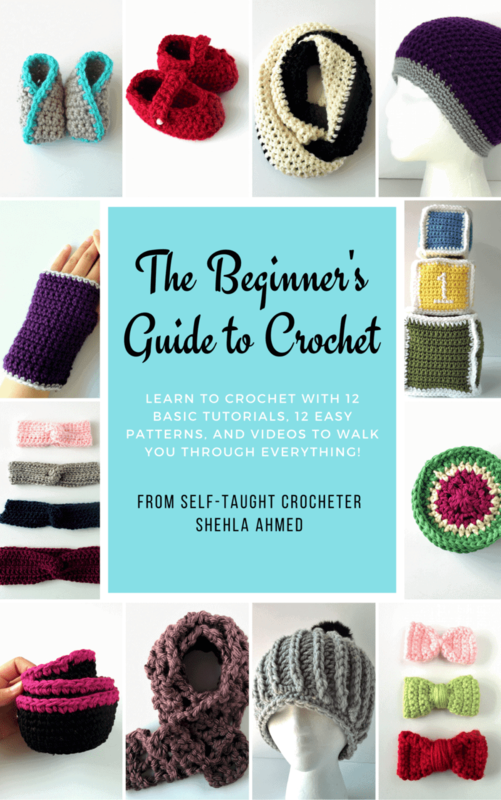 I also talked about this in my crochet for beginners ebook, called the Beginner’s Guide to Crochet, where I go over the basics of crochet and easy patterns to help you learn. It’s a free ebook you can pick up here. 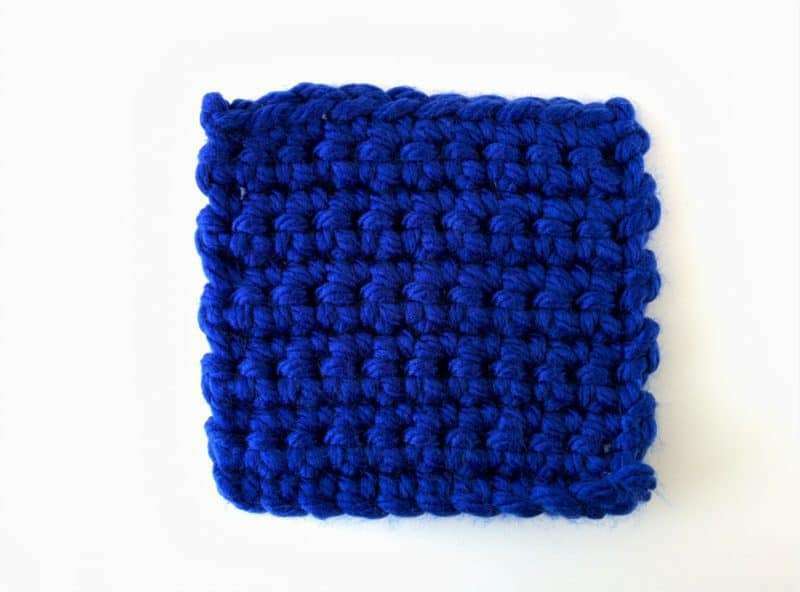 A lot of crochet for beginners courses and tutorials use videos to teach simple patterns. This is really helpful when you’re just learning, but don’t fall into the trap of relying on the videos to walk you through the pattern. Learn to read patterns. You’ll be able to make so much more and even change and customize projects if you understand what the pattern is actually telling you to do. A great way to learn how to read patterns is by breaking it up and reading each step separately. Look at what it’s actually asking you to do. Here’s a random line I pulled from my Rosebud Slouch Pattern. Round 7: (Still in pink) Chain 3, skip 3 spaces and DC into the 4th space. *Sk 2, work 3 DC into the next space* and continue from * all the way to the last space. DC 2 into the last space and slip stitch to the top of the chain 3. Now, what is it asking you to do? I’ve bolded each individual step so you can see how simple each part really is, rather than reading the whole line at once and getting confused. Using pink, Chain 3, skip 3 spaces and DC into the 4th space. Chain 3, skip 3 spaces and DC into the 4th space. Isn’t it much simpler to break it down like that? When you look at a crochet hat, someone who doesn’t crochet just sees the finished hat. But you know that it was made one stitch at a time and you know how to make those stitches. 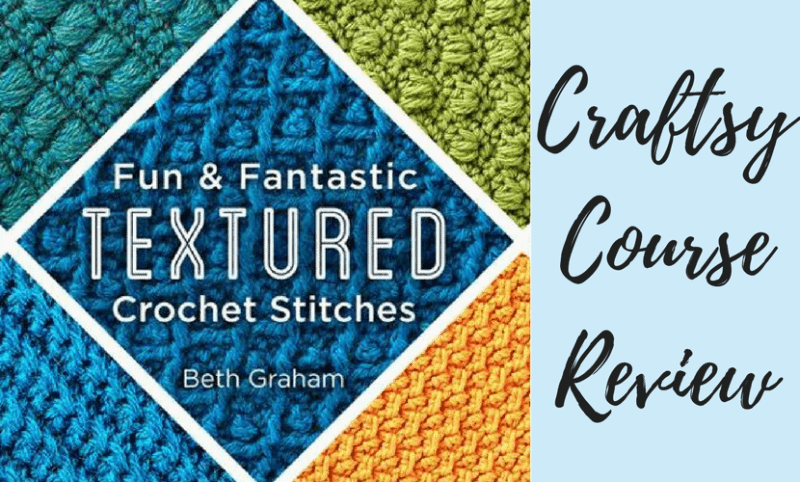 Let me know if you want to go more into depth on reading patterns and I’ll add that to my crochet for beginners posts. If you often forget where you are in a pattern or how many rows you’ve worked, get into the habit of marking them on your pattern to keep track. 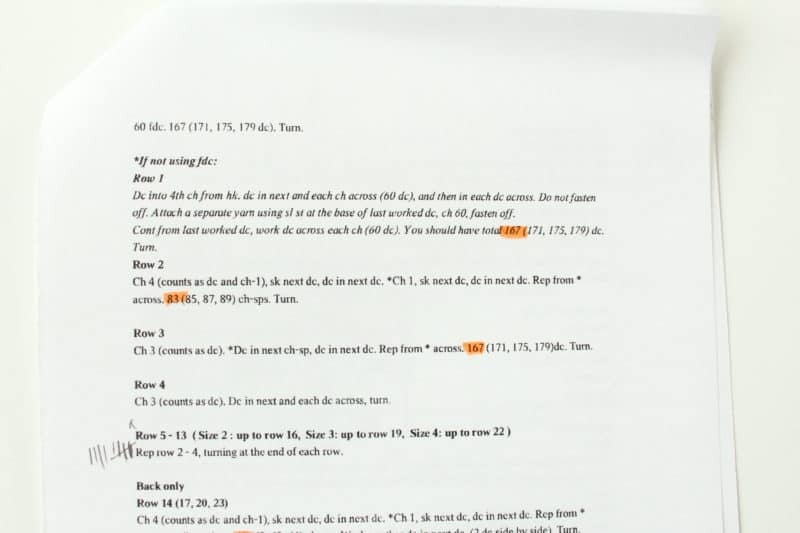 Print out your pattern and simple cross of the row number after you’ve worked it. Or highlight the row. Whatever helps you see that it’s done. For patterns that ask you to work # of rounds or increase ever nth row, use tally marks in the margins of your pattern or on a post it. I use a stitch marker to mark the first row/round, and then I use my tallies to track the rest. This way, it’s easy to keep my place in the pattern if I walk away from it, and I can double check without a problem. 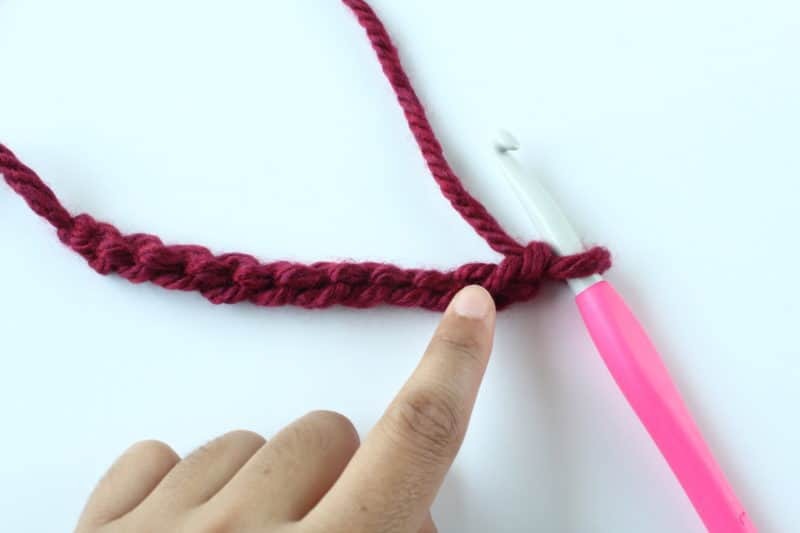 This crochet tip is one of my favorites, especially when it comes to crochet for beginners. Before you start working, just read over the pattern and make sure that a) you have everything you need, and b) you understand it. I like to read over patterns so that I can get an idea of how the piece is going to come together. When I made the Sporty One Piece Cardigan from Craftsy, I read over the pattern first to see how the sweater would take shape. What that “one piece” would look like. Then, I could easily make it longer and adjust it, even though this was my first real sweater. Looking over patterns first also helps you find any techniques or stitches you aren’t familiar with so you can practice them a little first. I learned how to work foundation crochet stitches because they were used in the cardigan pattern and I tried them out before starting. One of the most annoying things is to run out of yarn midway through a project. It’s even worse if you buy yarn that says it’s the same color but then it doesn’t match what you’ve already done! Sound familiar? The best way to prevent that is to buy enough yarn before you start. The patterns usually have an amount of yarn used or the number of skeins used of a specific yarn. Use that and the size you’re making to calculate how much yarn you will need, and buy it in one go. If you DO run out and need to buy more, check the dye lot number on the label to make sure it matches the color. Dye lots are batches of yarn that were dyed together so they’d be the same color, even if other dye lots are slightly off. 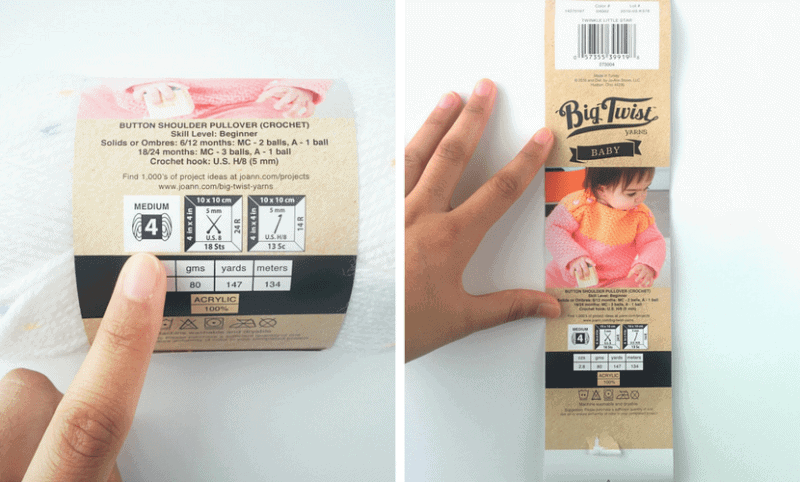 I have a whole post on how to read labels where I talk more about calculating the yarn you need and everything else on labels. Read it here. Finish your last stitch and trim the yarn. Pull the tail end through the stitch and thread it onto a tapestry needle. Now, bring the needle under both loops of the first stitch in the round (right next to it). If there’s a chain stitch there, skip it, and work into the actual stitch. Then, bring the needle through the center of the last stitch you worked. Then just weave in the end and trim. 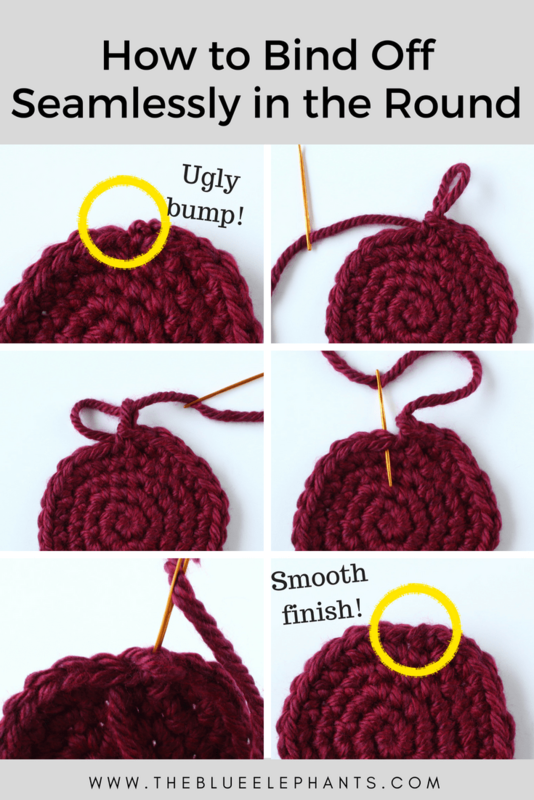 I didn’t learn this until YEARS after I started crocheting, but I wish it was part of more tutorials about crochet for beginners. I love the bind off edge of a crocheted piece, especially for blankets. The neat little Vs all lined up and make the piece look more finished and clean. However, the edges and the beginning edge don’t have that same neat edge; instead, they have chains and the sides of your stitches. To clean up all the edges, work one round of SC around the entire piece and finish with that invisible join I showed you above. Work one stitch into the side of each row and if it’s a DC or taller, or a chain of a 3+, work a few more SC to compensate. You don’t have to keep track of the how many stitches (unless otherwise stated in your pattern), but work 3 SC into each corner to keep them flat. This gives you an even border all around that you can leave as is, or use as a base of your crocheted border. Similar to the SC border above, you can get a nice clean edge on the foundation chain edge too. When you work your chain, notice that you have a V shape and an extra little bump at the back. Instead of working your first rows into the chain, insert your hook through the back bumps. This makes the V-edge point outwards so it will match the bind off edge. Not all items need blocking, but most will benefit from it. It helps even out the shape a little, smoothe out creases from being held, and it creates a clean edge to seam from if you need to join pieces together. Take the extra step to block things like granny squares, motifs, washcloths, blankets, and garments. If you’ve worked anything in fair isle or lots of color changes, I would block those too. It just helps even out the stitches and makes everything look more professional. If you hate weaving in the ends as much as I do, try this tip. When you cut the yarn and attach new yarn, work your first few stitches over that tail end to weave them in. You’ll trap them in between the rows and get them out of the way. You still have to weave them in the opposite way to really secure them but it goes much faster when it’s already half done. If you’re really serious about learning a new technique or improving something you just can’t seem to get right, try taking a class to help you out. 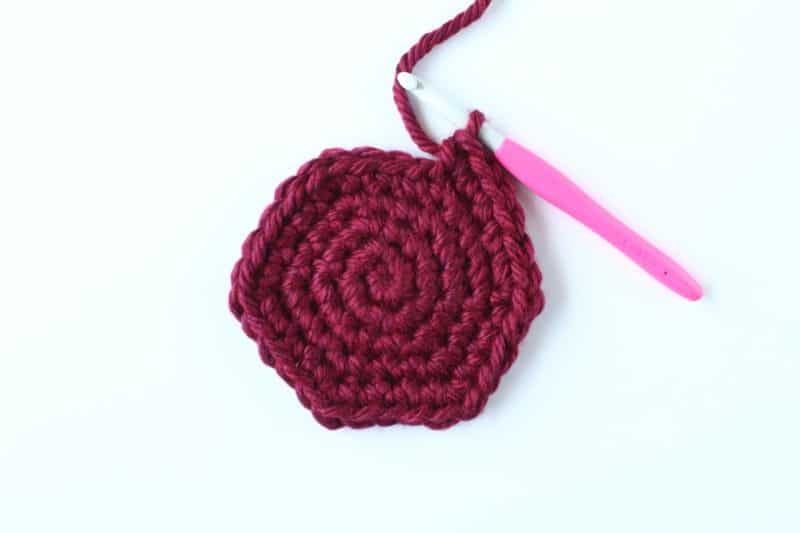 Blog posts and tips from other crocheters are great but sometimes the best way to learn something new is to take a class specifically focusing on that topic. There are a lot of crochet for beginner classes, but also classes for those who are more advanced. It’s really just about finding one for your needs and sticking through it. I really love taking classes on Craftsy and there are so many to choose from. This course on finishing techniques for knitting really helped me finally get nice even seams and it gave me several tips on how to make my finished item look cleaner and more refined. I’m also taking this class on hand embroidery right now and I love it! 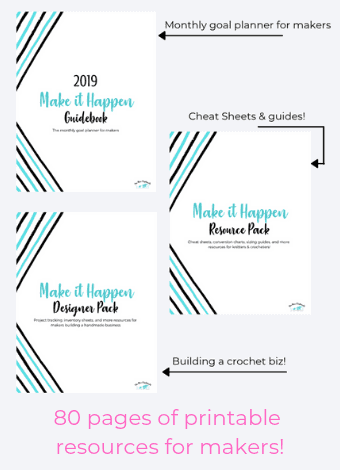 It’s covering the basics so I can follow along easily and there are great resources included, like printable patterns and course discussions where the instructor helps you out. Last but not least, stay organized! As a beginner, you may not realize how much stuff you accumulate as a crocheter. With all the patterns, notions, yarn, and all the little bits you need to make something, it can get cluttered. Try to stay organized as possible from the beginning so you don’t have to worry about it as your collection of yarn and patterns grow. It also makes it much easier to get through projects when you have everything you need in a neat, organized way. For you yarn and other notions, I recommend using bins and drawer units. They’s help you keep your stuff together and also categorized however you like and it grows with you. 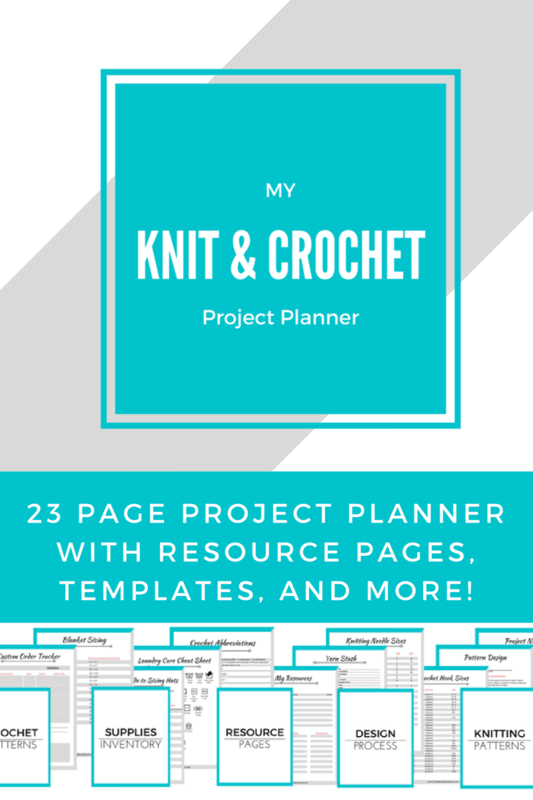 As for organizing your patterns and resources, I use a binder and my Knit & Crochet Printable Planner. This is actually a planner I designed for my own use so it has everything I need and more. There are pages to organize the patterns you’ve purchased and to note any changes or customizations you made to them. This way, the actual pattern stays clean. 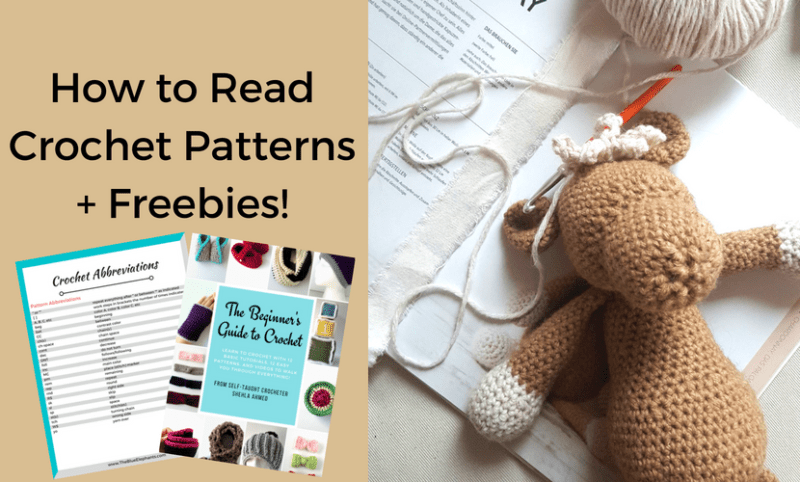 You can use these pages to store and organize all your favorite patterns and then recreate them when you want. There are design template pages for those who want to design their own patterns. I’ve also included resource pages with UK/USA terms, needle and hook sizes and inventory pages to track your yarn stash, favorite books, blogs, and designers, and even some sizing guides so your project always fit. 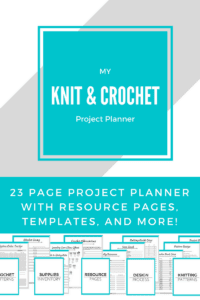 My Knit & Crochet Printable Planner is available in my Etsy shop if you want to pick up a copy for yourself. 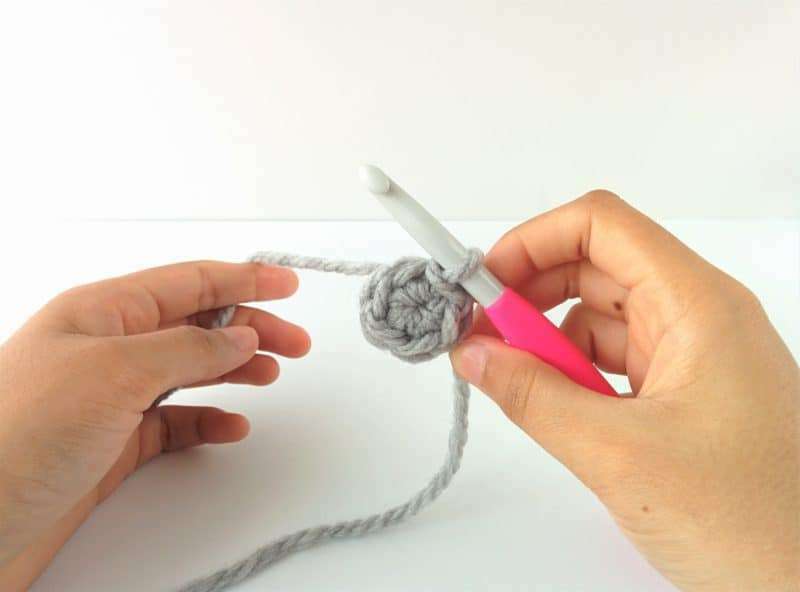 What are some of your favorite crochet tips? Let me know in the comments below and be sure to subscribe down below to get more tips, patterns, and freebies delivered to your inbox every week. It’s free and you get some great things!